I do get that question from tennis fans or people who are going to buy a new tennis racket pretty often. Which tennis racket is most used by tennis professionals. Everybody knows that Roger Federer plays with Wilson ProStaff and Nadal with Babolat but what with other tens of players entertaining us on courts all the year long. We run a database of ATP and WTA professional players and their rackets, so we feel it is our duty to put here the summary of all numbers. Now everybody can read which racket brand is most used by Men and Women professional players. And moreover which racket brand is most successful on pro tour. In men’s tennis, there are two big brands which compete for the title of the most used brand. It is HEAD and WILSON. Currently, Wilson has one more player in ATP TOP 100 than Head. In the year 2015, Wilson was most used, in 2016 Head was the most used racket brand in ATP TOP 100. The third most used brand among men professional tennis players is BABOLAT. Altogether three most used brands have more than 3/4 of ATP 100 players under the contract. The rest of players have used mainly YONEX and PRINCE rackets for years. However, this year TECNIFIBRE made a move mostly on Prince expense and become fourth most used brand among men. Almost 70 percent of WTA TOP 100 players are using rackets of one of two racket brands. BABOLAT is holding the lead for last two years, with WILSON closely behind. We can call it almost duopoly. Another 20 percent of women top tennis players are using HEAD or YONEX rackets for last two years. The rest of players has divided between 5 another brands. Two of them, SLAZENGER and VOLKL are seen just on WTA tournaments. One thing is being a most used, but other and for many people more important, is being a most successful tennis racket brand. The year 2017 is the year of change between the winners of ATP tournaments. Until this year HEAD owned the ATP tour. This year, mostly thanks to Novak Djokovic and Andy Murray injuries, WILSON and BABOLAT took the lead. Wilson thanks to the return of Roger Federer, Babolat thanks to Rafael Nadal comeback. How important are Djokovic and Murray for Head? In 2015 Djokovic won 11 and Murray 4 tournaments, in 2016 Djokovic won 7 and Murray 9 tournaments. That is 15 and 16 tournament wins per year. This year they won just 3 tournaments (2 Djokovic, 1 Murray). Other brands are picking up just a few tournament wins. YONEX, was the only exception last year with 8 wins, thanks to Stan Wawrinka (4 wins) and Nicky Kyrgios (3 wins) performances. BABOLAT and WILSON are most used racket brands between WTA TOP 100 players and they are also most successful. Last year Babolat had most tournament wins, this year WILSON has most tournament wins. Other brands lag behind with quite big difference. Check our regularly updated tables of ATP and WTA tournament wins. Any idea what string tensions are being used? Also, are the racquet models they use the same as the ones in stores? String Tension – There is no general answer. String Tension is different for every player, every place they play (surface, condition, weather, singles or doubles). 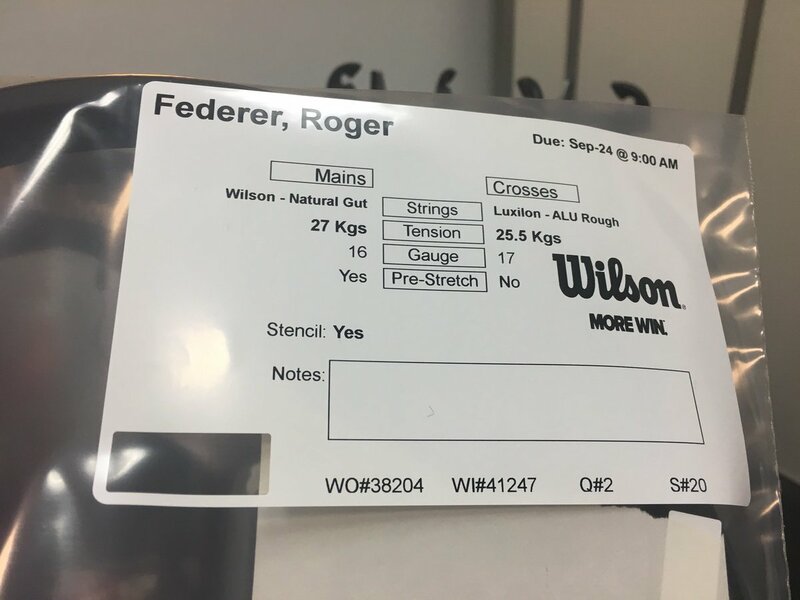 Just as an example here – Roger Federer racket string tension for doubles (with Nadal) at Laver Cup. Racquet models – There is a lot of opinions about it. I think that top players play with adjusted models/frames so they are not the same like in stores. However, that is a privilege for really best players. I suppose, that no brand is willing to offer any special adjustment to a player out of top100. So they are using store models and adjust weight themselves. Thanks for this. What is the most used racket on tour within Wilson? Is it the pro staff, the blade, other? Unfortunately, we do not have such detailed database. But my guess (from what I saw on pro tournaments) is that Blade is most used within Wilson. Followed by ProStaff and Burn. Since the top players are sponsored by companies the data is probably skewed. So I wonder what are the most common rackets and model used by unsponsored players in the atp tour? Do you have that data? I think that would be valuable to tennis readers especially since most pros use custom rackets rather than the factory models which most people here would end up purchasing. You are right, to know the preferences of players regardless of the sponsor contracts would be great. But it is hard to collect such data. First of all, the majority of ATP TOP 100 players have contracts with racket manufacturers in place. Secondly, the ones without sponsors contracts are usually doing a paint job to hide the brand and type of the racket. The reason is, that nobody is willing to do PR for free.